Some people are under the misconception that challah baking is a time-consuming, messy job. On the contrary, with today’s heavy duty mixers, handy gadgets and easily cleaned pans, challah baking is simpler than, say, cheesecake. It certainly is a lot more foolproof! We love Fleishman’s instant yeast for its ease of use and convenience. No need to activate —simply add to the flour. Sift the flour into your mixer bowl. Add the instant yeast and sugar. Stir to combine. Add eggs and oil. Add the water, and add the salt last. Mix at medium speed for 10-12 minutes. Remove dough from the mixer bowl and allow to rise in a large bowl covered with plastic wrap for 45 minutes. Take challah. Divide dough into 5 equal parts. To be really precise, you can weigh each piece on a scale and check that they are equal. Working with one part, divide it into 6 equal pieces, rolling out each into an 8-10 inch strand. Place two strands 2 inches apart, side-by-side horizontally across your work surface. Place the second two strands lengthwise over the first two, approximately 2 inches apart. Your dough will look like a tic-tac-toe game. Next, place the fifth strand in the width over all the previously placed pieces, centered between the 2 horizontal strands. Place the last strand vertically on top of and perpendicular to the fifth, centered between the third and fourth strands. It should look like a plus sign lying on top of a tic-tac-toe grid. Starting with any corner, gently lift 3 strands without stretching the dough too much, and braid until you reach the end of the strands. Move to the next closest three strands and braid once again. Repeat with the next three strands and again with the remaining three strands. Tuck the ends of each braid underneath the challah. Grease and flour a 3”-deep by 7”-round baking pan. 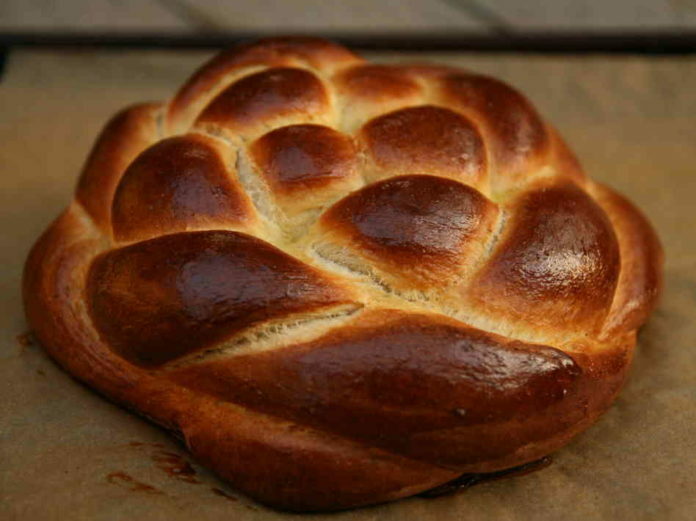 Place challah in the pan and repeat braiding instructions for each of the remaining 4 pieces of dough. Allow to rise 30 minutes and brush lightly with egg wash. Sprinkle sesame or poppy seeds to your taste. Turn on your oven to 450 degrees and immediately place the challahs inside. During the time that it takes the oven to warm, the challah will continue to rise. After 15 minutes, lower temperature to 350 degrees and bake 45 minutes longer. If you are baking in advance, always put your challahs in an airtight bag before freezing. We like 2 gallon zipper bags or freezer bags. Shopping bags, even doubled, will not prevent freezer burn or odors from being absorbed by the challah. To reheat frozen challah, heat the oven to 350 degrees, turn off the oven and place the challahs inside. They’ll defrost and warm in about 30 minutes without drying out. Storing the challah in paper bags on Shabbos will keep the crusts crispy until the last piece is eaten.